Jerusalem should “be liberated from the yoke of Israel,” says Rouhani at meeting with the speaker of the PA parliament. The comments were made during a meeting in Tehran between Rouhani and the Speaker or the Palestinian Authority (PA) parliament, Salim Zanoun, and were reported by the semi-official Fars news agency. “One of the wishes of the Iranian nation is liberation of the Holy Quds,” the Iranian President was quoted as having said, adding that he hoped “the Palestinian nation and the entire Muslim world will find a serious solution to this occupation through unity and integrity”. Wednesday’s meeting marks the second time in recent weeks that Iranian officials have met PA officials. In January, Jibril Rajoub, a senior member of the Fatah movement, visited Tehran. Rajoub vowed during the visit that Fatah "will not stop the resistance until the establishment of an independent Palestinian government" in eastern Jerusalem. Rouhani, who has tried to woo the world with “an attack of smiles” and by claiming he is moderate, has made anti-Israel statements just like his predecessor, Mahmoud Ahmadinejad. 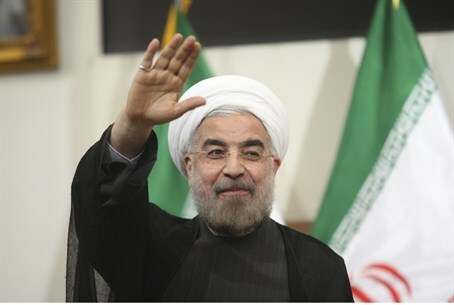 Last week, Rouhani warned that Iran would issue a harsh response against any attackers, including Israel. The Iranian government also released a statement in which it called "to remove the cancerous tumor - Israel." Shortly after being elected last summer, Rouhani called Israel an "old wound" that "should be removed." Iranian media later claimed that Rouhani’s remarks were distorted.